Authentic reproductions of the open backed AC-30 enclosure, manufactured by North Coast Music, authorized and licensed by Vox Amplification, Milton Keynes UK. The cabinets are constructed from 3/4" baltic birch, featuring gussetted locking half lap construction with bolted baffles, covered in basket weave vinyl, and available with either brown, black, or blue diamond fretcloth. One pin corners, and a single NCM-074 handle are also included. The speaker connection uses a three pin male XLR jack, as used by JMI Vox in the 1960s. Cabinets purchased without speakers include a 20" long speaker wire on the speaker jack. Cabinets purchased with speakers installed come fully wired. The speaker cable needed to connect to your amp head is not included but is offered separately by North Coast Music. All speaker mounting hardware is included. Nameplate is included and installed by North Coast Music. 27.25" x 20.25" x 10.375". Approximately 40 pounds. All North Coast Music reproduction cabinets are hand made by order. Please allow several weeks for shipment from time of order. NCM-045 AC-30 Enclosure - No Speakers - Choice of brown, black, or Valvetronix blue Vox diamond grill, correct logo, open back, no speakers. An original style three pin XLR speaker connector with a 20" twin lead wire to connect internally to the speakers is included. The cable needed to connect your speaker cabinet to your amp head is available by clicking here. Microphone cables do not work between Vox heads and cabs..
Dimensions: 20.5" tall, 27.25" wide, 10.5" deep, less stand. About 40 pounds less speakers. Continental US sales only. All North Coast Music reproduction cabinets are hand made by order, no returns or exchanges are possible. 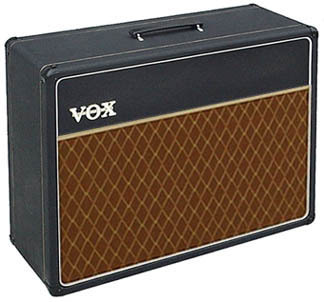 Prefer to purchase your empty AC-30 cab with brown grill on Reverb? Click here. 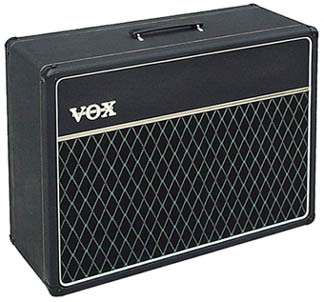 Prefer to purchase your empty AC-30 cab with black grill on Reverb? Click here. 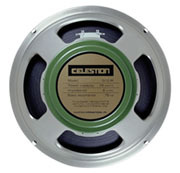 NCM-045GB - AC-30 enclosure with two Celestion Greenback Speakers - Choice of brown, black, or Valvetronix blue Vox diamond grill, correct logo, open back, with two 25 watt 12" Celestion Green Back 8 ohm speakers installed. 16 ohm cabinet. The cable needed to connect your speaker cabinet to your amp head is available by clicking here. Microphone cables do not work between Vox heads and cabs..
Dimensions: 20.5" tall, 27.25" wide, 10.5" deep, less stand. About 52 pounds. Continental US sales only. VAP-30CB - Closed Back Option for NCM-045 and NCM-046 AC-30 Cabinets (replaces individual open back panels with a solid back). This solid back is made from 3/4" 13 ply baltic birch plywood, covered in matching vinyl, that has been milled around the outside inner edges to fit flush into one of our AC-30 cabinets. Must be purchased in conjunction with as NCM-045 cabinet, and is not offered or sold separately. Not pictured.